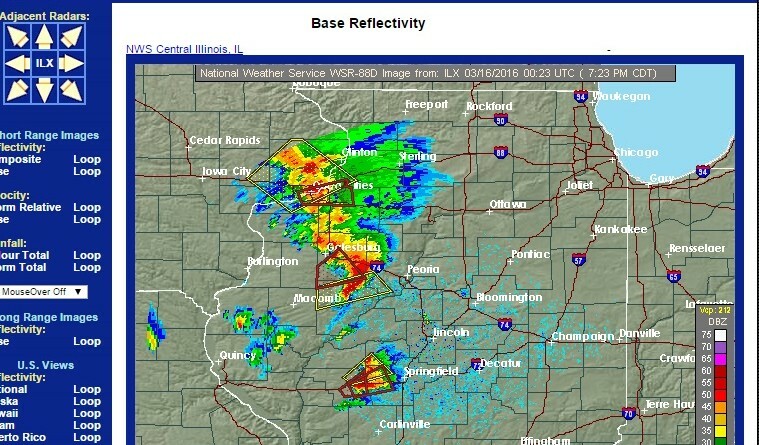 There is an on-going severe weather and tornado threat for Western Illinois right now. The Storm Prediction Center has issued an ENHANCED RISK for severe thunderstorms and tornadoes for portions of western Illinois and a SLIGHT RISK for storms for the Chicago area later tonight. Currently there are tornado warnings in effect. 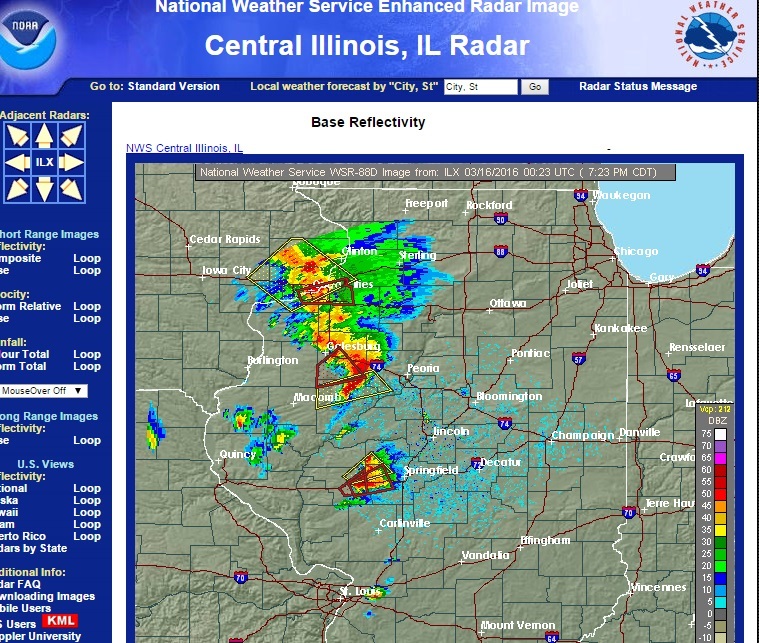 Check your local NWS for the latest tornado warnings. Here’s a look at the tornado that occurred near Bushnell, IL just a bit ago from Twitter via @MichHartWX. 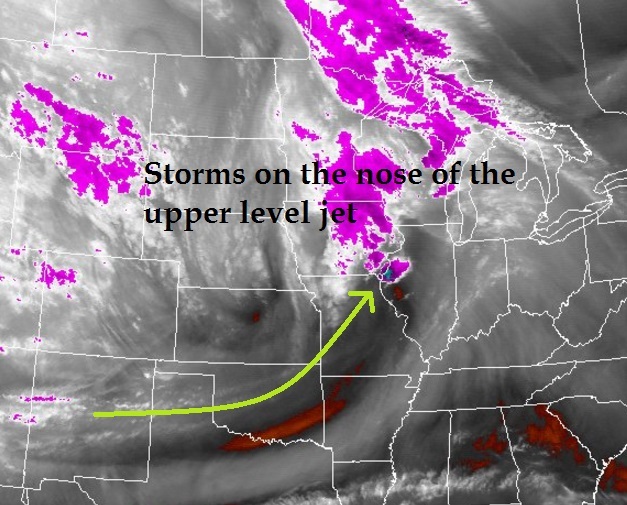 Reminds me of how the Mapleton, IA tornado looked back in 2011. Here’s a view of the current surface conditions, ample dew points (upper 50s) provide ample moisture, this combined with decent instability (CAPE) and great amounts of bulk effective shear make the environment primed for a continued tornado threat. ABC 7 News in Chicago explains the threat of severe weather Chicago faces tonight here Some of the Western and Southern Chicago suburbs are currently under a Tornado Watch until 9:00 pm tonight. 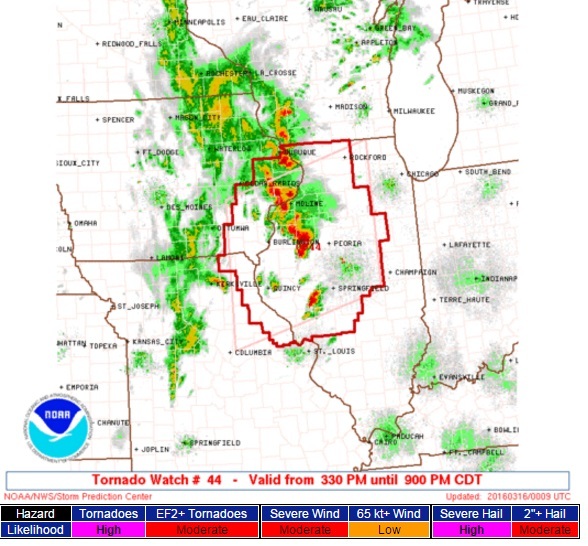 Remember: a Tornado Watch means conditions are favorable for tornadoes to form, Tornado Warning means a tornado is occurring and to seek shelter immediately. If a tornado warnings is issued for your area, seek shelter immediately! and go to the lowest interior room of a building or a basement.